In Ensenada in 1978, from left, are Mullen, Pfahler, Paulson and Sterling. In the early years when the four of them got together, they talked about boyfriends. Later, they talked about their husbands, and then their kids. 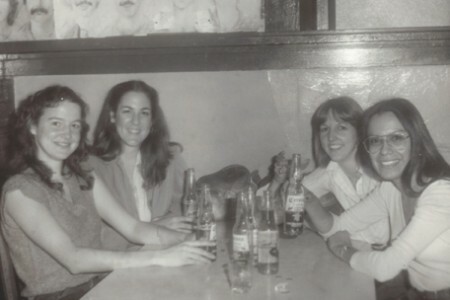 Four women who lived together in the Spanish House and went on their first trip together to San Francisco during the 1977 interim session have continued to meet each year for a three-day getaway. Sometimes Dottie (Roman ’78) Sterling, Marvie (Jaynes ’78) Paulson, Jocelyn (Hughes ’77) Mullen and Andrea (Bogiagis ’77) Pfahler go to Las Vegas, sometimes to Puerto Vallarta or Austin or Sedona or Breckinridge. One year when one of them had a new baby, they rented a cabin near to her parents so she could breastfeed in private. But always they get together to catch up on their lives. “It’s not about the place,” said Sterling. “It’s about being together. It was tough when we were all raising kids, but our husbands were really supportive.” And no matter how busy their lives were, “I wasn’t going to miss that weekend,” she said. Thursday nights they are in the hotel room catching up. On Friday they sightsee. And often, at least in Vegas, they can be found lying by the pool. They have plenty in common. All four are still married to their first husbands, all have two or three children, all have put their kids through college, and all now work in some form of education. Sterling is in special ed. Paulson is a school counselor. Pfahler is a substitute teacher. And Mullen is an administrator in the Los Angeles County library system. She also was the first to become a grandmother. Steve Sterling ’78 and the other husbands and children know each other well, having met for Christmas parties and family events through the years.